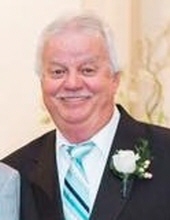 Joey Eugene Norman, 64, of Escatawpa, MS, passed away on Saturday, February 9, 2019 at home surrounded by his family after a courageous battle with cancer. Joey was born on November 2, 1954 in Starke, FL to the late James F. Norman and Shirley Lucille Hau. Joey enjoyed fishing, gardening, and home improvement projects. He especially enjoyed spending time with his family and with his dog Zeus. In addition to his parents, Joey was preceded in death by his brother, David Norman. He is survived by his loving wife of 32 years, Catherine Brondum Norman; daughters, Heather (Brandon) Boyd, Haley (Nick) Bosco, and Kellie (Todd) Davis; grandchildren, Aaron Davis, Nathan Davis, Abigail Davis, Noah Boyd, and Peyton Boyd; sisters, Shirley Eubanks and Donna (Charlie) Garner; step-mother, Sharon Norman; along with several nieces, nephews, cousins, and friends. The visitation for Joey will be held on Wednesday, February 13, 2019 from 1:00 p.m. until 2:00 p.m. at Heritage Funeral Home in Escatawpa, MS. The funeral service will follow in the funeral home chapel beginning at 2:00 p.m. with Bro. Todd Davis officiating. Interment will be held at Griffin Cemetery in Moss Point, MS. In lieu of flowers, the family has requested donations be sent to the Pascagoula River Audubon Center, 5107 Arthur St., Moss Point, MS 39563 or online at Pascagoula.audubon.org or to a charity of your choice. To send flowers or a remembrance gift to the family of Joey Eugene Norman, please visit our Tribute Store. "Email Address" would like to share the life celebration of Joey Eugene Norman. Click on the "link" to go to share a favorite memory or leave a condolence message for the family.